Dr Julia has developed Continued Professional Development (CPD) Musculoskeletal (MSK) management courses for clinicians looking to develop their skills. Dr Julia’s teaching skills are widely recognized through Canada with multiple awards. Dr Julia currently provides courses through MSK Courses and in partnership with the Center for Effective Practice for the Ontario Low Back Pain Strategy. You can select one of the upcoming sessions in the menu on the right for more information. MSK Focus, a two day program in small interactive group. 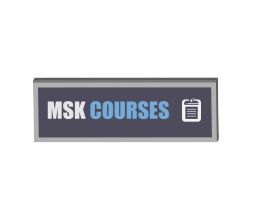 MSK Connect, a five day course program delivered and available in two formats: an introductory MSK course; or, a more advanced format, for participants who already have a background in MSK, allowing them to upgrade their skills. MSK 5 Weekend Certificate which provides depth and details for personal clinical MSK skill development. Download PDF brochure. Teaching Institutions and prospective students who are interested in the MSK course programs will find more details on the MSK Courses website. Courses have been developed with the University of Toronto Department of Family & Community Medicine (DFCM). Dr. Julia Alleyne is a sport medicine physician and physiotherapist and is currently the MSK Lead for Outpatients at Toronto Rehab and is the Chief Medical Officer for the Invictus Games in 2017 in Toronto. She holds academic appointments with the University of Toronto, Department of Family and Community Medicine. She was Chief Medical Officer for the Canadian Olympic team in London 2012, and the 2015 PanAm Games in Toronto.